Sticky notes, who doesn’t use them?! Now, you can have your own sticky notes on webpages. 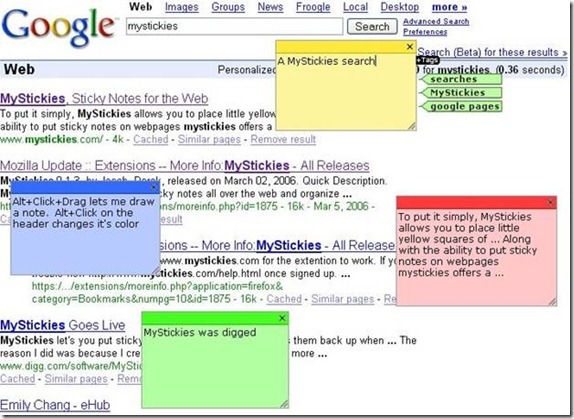 MyStickies is a free software that allows you to post stickies on webpages and save them for later usage. You can later on review and edit those notes from a different computer. MyStickies not only bookmarks the webpages in its online repository, but also saves the pages on how you tagged content on it and presents it the same way later. for more Sticky Note Taking web applications, click here. Posted in Stuck in the MomentTagged announcements, entertainment, innovation, mystickies, random, sticky notes, technologyBookmark the permalink. here Sticky Notes for FREE!!! | Chantal’s thoughts. And I do have 2 questions for you if you tend not to mind. Could it be just me or does it look like some of these remarks come across like coming from brain dead visitors? 😛 And, if you are writing on other online sites, I would like to follow anything fresh you have to post. Would you list of every one of your public sites like your twitter feed, Facebook page or linkedin profile?